Let’s face it, choosing the right exchange in 2019 is no easy task. With literally hundreds of exchange platforms competing for your attention, there is now more choice than ever. Fortunately, customers no longer need to compromise when choosing the platform that fits their needs best. However, there are still scams out there. We’ve reported on enough of them to know. Furthermore, selecting among reputable exchanges can still be difficult. At BeInCrypto, we understand this and are working to make things easier by reviewing some of the best exchanges on the market. In this article, we review Binance to help you determine whether or not the exchange is a good fit for your needs. Who Does Binance Report To? Launched in 2017, Binance has become one of the biggest and most popular cryptocurrency exchanges on the market. It hasd developed somethign of a cult-like following. Binance launched with an innovative new exchange model that provides benefits to traders that hold its native token – Binance Coin (BNB). The exchange initially provided BNB holders up to 50% discount for paying transaction fees in BNB, with this fee discount halving every year until 2020, before being phased out in 2021. During its ICO in early 2017, the team behind Binance promised a high-throughput exchange capable of matching as many as 1.4 million transactions per second. This would allow Binance to serve levels of demand that would cripple other exchanges. Since its launch, Binance has gained popularity among ICO investors thanks to its customer-focused listing practices, which see only the strongest cryptocurrencies and tokens listed on the platform, protecting its users against the myriad scam projects that can often be found on less discriminate platforms. What Trading Features Does Binance Offer? Binance is useable by investors and traders of all experience levels from the trading beginner to the crypto veteran. The exchange neatly separates its trading features into two different categories. The first is targeted towards less experienced users while the second in more feature-intesive and developed for the experienced investor. If you are a beginner to cryptocurrency trading, then you will likely be interested in the basic setting. This will allow simple navigation across the exchange. The interface is also very easy to use as well. Furthermore, many assets an be bought and sold with various cryptocurrencies without much of a learning curve. However, if you select the advanced setting, you will be greeted with a much more aggressive user interface. This option is designed to perform complex market analyses and projections in addition to simply placing an order. The advanced order setting offers all of the same features as the basic option, but with additional charting tools. This allows users to add indicators, trend lines, and additional information to their charts. More extensive technical analyses can be performed using htis plattform. Both the simple and advanced user interfaces feature the same order options. Here users are able to place limit, market and stop-limit orders. However, more complex trading features such as margin trading and advanced conditional orders are absent from both options. Overall, Binance features a good mix of order options and charting tools for the beginner to intermediate cryptocurrency traders, but more advanced traders may feel overly restricted by the limited repertoire of order types. For accounts with under 100 BTC trade volume, Binance charges a 0.1% trading fee for both market maker, and market taker orders, which is among the lowest in the industry for low volume traders. Beyond this, Binance offers two ways to reduce the trading fees further, down to as low as 0.0150% and 0.0300% respectively for makers and takers. Binance was also one of the first exchange platforms to implement a clever fee discount for holders of its native token, Binance Coin (BNB). Currently, BNB token holders will receive a 25% discount on their trading fees if BNB is used to pay them, and this discount can be combined with the volume-based discounts mentioned previously. This BNB fee discount is reduced on a yearly basis and will fall to 12.5% in July 2019. A year later it will drop to 6.75%. In July 2021, it will be phased out altogether. Overall, this seems to have proved a beneficial marketing technique as it has drawn attention to the exchange. Furthermore, Binance does not charge a fee for cryptocurrency deposits. However, small fees are charged for withdrawals to external wallets. The fee differs based on the asset being withdrawn. The fee is usually just enough to cover the standard network cost. As far as we can tell, these withdrawal fees are very reasonable. Bitcoin (BTC) can be withdrawn for just 0.0005 BTC for Bitcoin withdrawals while 0.01 ethers is the fee for Ethereum and 0.001 LTC for Litecoin withdrawals. In addition, Binance has one of the lowest withdrawal fees for Tether (USDT) compared to most other exchanges at just 2 USDT per withdrawal. One of the reasons Binance is so popular is due to its relatively relaxed verification requirements, allowing users to register for level 1 verification with minimal personal information. To achieve level 1 verification, Binance simply asks you to create an account and verify your email, providing all level 1 verified users a 2 BTC daily withdrawal limit—with no limits on deposits or trading. Although level 1 verification is sufficient for most users, Binance also offers the option to upgrade to level 2, requiring you to submit basic personal information such as your name, date of birth and address, as well as provide photographic identification in the form of your passport, national ID or driving license. After achieving level 2 verification, your daily withdrawal limit will be adjusted to 100 BTC. Again, there remain no limits on how much you can deposit or trade. Note that identity verification is required to purchase cryptocurrencies using a debit or credit card through Simplex. If you need to withdraw more than 100 BTC daily, you can contact Binance for level 3 verification by opening a support ticket. This will require more extensive verification and will need to be manually negotiated with Binance. One of Binance’s biggest selling points is undoubtedly its extensive digital asset selection. It is currently the third largest on the market—only YoBit and HitBTC have more available trading pairs. Furthermore, the majority of digital assets on Binance are high-quality projects which have a realistic shot at long-term viability. Unlike many other exchanges that simply list any and all assets to get their numbers up, Binance is extremely selective with their listing process. The exchange only lists assets that have substantial market demand. In addition, it regularly delisting assets that fall short of defined expectations. In total, Binance has more than 150 digital assets listed—including all of the top 15 largest cryptocurrencies by market capitalization. The exchange even offers stablecoin-to-stablecoin trading pairs—namely USDT/TUSD and USDT/PAX. This grants users the rare opportunity to profit on stablecoin price differences. On Binance, Bitcoin (BTC), Tether (USDT), Binance Coin (BNB) and Ethereum (ETH) have the largest number of trade combinations, being tradeable against many of the smaller digital assets on the platform. In total, BTC alone has well over 100 trade combinations, while USDT and BNB have a similarly high number of trading pairs. Overall, in terms of digital asset selection, Binance leaves little to be desired and can easily be considered one of the best exchanges for variety. When it comes to trading volume, Binance can be considered the most liquid exchange for many Bitcoin (BTC) trade pairs. Despite only being around since July 2017, Binance has since exploded in popularity, climbing its way to the very top of the exchange rankings thanks to its impressive trade volume. Binance regularly clocks in over $1 billion in daily trades and has a monthly trade volume in the range of $15-$25 billion—easily eclipsing its nearest competitors OKEx and Coinbene. Both of these appear to misreport actual trading volumes, however, whereas Binance displays honesty and transparency. Of this trade volume, the vast majority can be attributed to Bitcoin (BTC), Ethereum (ETH) and Binance Coin (BNB) trade pairs against USDT. BTC/USDT is alone responsible for more than 10% of Binance’s total trade volume. Beyond this, the great majority of trade pairs on Binance have excellent trade volume, with close to 100 trade pairs racking up over $1 million in daily trade volume, whereas only around 10% of trade pairs on the exchange suffer from relatively low liquidity—which we define as being under $10,000 in daily trade volume. Binance is one of the few major exchanges to report accurate trading data to volume trackers, as confirmed in a recent transparency report by The Blockchain Transparency Institute. According to the report, Binance is one of just three major exchanges to not fake its trading volume by wash trading. Since launching in 2017, Binance has managed to develop and maintain a reputation of excellent quality and trust. At the time of writing, the exchange had over 10 million users. Binance might also be considered one of the greatest ICO success stories. After raising $15 million in its ICO before launching its exchange, Binance now appears to flourish where other exchanges are lagging behind. Furthermore, Binance has delivered on its promise of becoming the world’s fastest and most powerful exchange platform. Much of the platform’s early success stems from its generous referral program. Referrers earn up to 40% commission on their friend’s trades, netting several of its most successful participants more than 100 BTC in profit. This company ethos has even led Binance to move countries twice in search of a more favorable regulatory environment – first from China to Japan, and then again from Japan to Malta in 2018. This move has been widely praised by the crypto community and has allowed Binance to operate with much more relaxed identity requirements than similar platforms. Moreover, Binance managed to build up a huge amount of positive market sentiment owing to the sheer success of its native token Binance Coin (BNB). The cryptocurrency has generated significant returns for investors—almost tripling in value since December 2018. As of writing, Binance is one of the few major cryptocurrency exchanges to have never suffered a security breach — due in part to the extensive security measures. Binance appears to work hard and dilligently to protect its users’ funds from any possible attack. According to its recent blog post, Binance thwarts several dozen hacking attempts per day thanks to its state of the art risk control system—which uses artificial intelligence and an army of personnel to monitor transactions on the platform. All suspicious events are flagged and acted upon to prevent loss of user funds. Interestingly, however, Binance makes no mention of storing its user funds in cold storage — widely considered to be the most efficient way of protecting user funds. Besides this possibly minor setback, Binance also offers a heap of client-side security feature. If secured correctly, a Binance account appear virtually unhackable. The first of these security options is two-factor authentication—which uses SMS and/or authenticator verification as a second layer of security after entering your password. In addition, Binance will also send out a verification email for each withdrawal. This helps to ensure that user funds aren’t withdrawn by bad actors who accessed a user’s Binance credentials. After receiving the email, the user must confirm that it was received before funds will be sent form Binance to an external wallet. When combined with two-factor authentication, this would mean any hacker would to have access to your Binance account, email address and mobile device in order to withdraw funds — a very difficult task indeed. Furthermore, to prevent phishing attacks, Binance also includes an option to send out a unique code with each and every email it sends to you, allowing you to determine whether an email you received is authentic or not. If a ‘Binance’ email contains the incorrect anti-phishing code, then you know the email is fraudulent. Binance also offers a surprisingly rare security feature known as address whitelisting—which essentially allows you to restrict which addresses can be used when withdrawing funds. This means that even if your account is somehow compromised, your funds will remain safe since they can only be withdrawn to addresses you previously whitelisted. 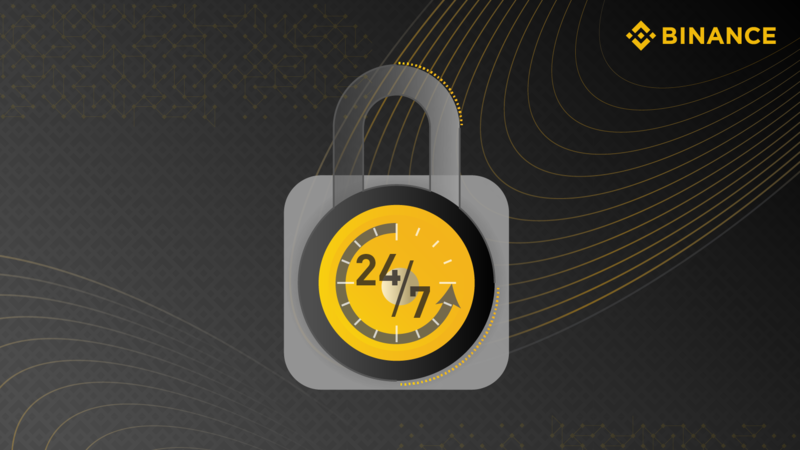 All-in-all, Binance features some of the most robust security we have seen from any exchange, with both server side and client side security being about as good as can be expected. Being a pure cryptocurrency exchange, Binance does not offer fiat deposits or withdrawals. Period. However, it does offer withdrawals for all the cryptocurrencies offered on the platform, with these typically being processed instantly. That being said, Binance has partnered with Simplex to allow fiat to cryptocurrency purchases on the platform. It does not offer the reverse, however. Fiat may be used to purchase digital assets on Binace using Simplex, but these assets cannot be converted back into fiat on the exchange. However, Binance did recently launch a sister exchange known as Binance Jersey—which can be used for trading Bitcoin and Ethereum against both the Euro and Pound Sterling. Since this is a separate platform, we will not be covering this exchange within the scope of this review. Overall, Binance is arguably one of the best exchange for pure cryptocurrency traders. Nonetheless, those looking for crypto to fiat markets will need to look elsewhere. Since Binance is not a legally registered money institution or money transmitter, it doesn’t appear that it needs to comply with the Foreign Account Tax Compliance Act (FATCA). Moreover, because Binance doesn’t handle any fiat currencies directly, it is unlikely to need to report user transaction details to any tax authority. That being said, US residents that meet the filing requirements for FinCEN may be legally obligated to submit their Binance account value to the United States Treasury under FBAR guidance on a FinCEN Form 114. It is unlikely that Binance will automatically report these accounts since it is out of the jurisdiction of the United States. This is further corroborated in the Binance user agreement which broadly states that users are responsible for reporting their own profits—though Binance will cooperate with authorities if it is forced to by legal mandate. Overall, it appears that Binance does not automatically report its users to tax authorities. There is no evidence that it plans to do so in the future. Like most cryptocurrency exchanges, Binance uses a comprehensive FAQ as its first line of support – providing template answers for the great majority of user concerns. However, for more complex or highly specific issues, Binance offers support through its website ticket system, which requires registered users to submit a support ticket which will be attended by the support team. For an exchange growing as fast as Binance, you might expect the support to be horrendous. This is not the case. The majority of concerns appear to be responded to and resolved within a few days. That being said, Binance, like most other large cryptocurrency exchanges does have its fair share of horror stories, with users complaining about terrible customer support, and there are reports of lengthy response times. Overall, Binance has an extremely restrictive range of customer support options, offering just a single route to access customer service. This, in addition to the extreme growth of the platform frequently leads to delayed support, making Binance subpar in the support department. Overall, Binance is an excellent exchange for both cryptocurrency trading newbies and intermediate traders that are looking to get to grips with a wide variety of digital assets with very reasonable fees. The exchange features the highest volume of any exchange currently in operation and is one of the leading platforms in terms of asset variety, being one of the few places where stablecoin to stablecoin trading is supported. Offering near flawless security and bringing an excellent reputation of delivering on its promises, Binance has found itself at the epicenter of the cryptocurrency industry and is widely considered to be among the major forces driving innovation in the space. Despite its immense following, Binance still appears to have much more gas left in the tank, but it still has room for improvement in the areas of customer support, fiat integration, and advanced trading features. Disclaimer: The contents of this article are not intended as financial advice, and should not be taken as such. BeInCrypto and the author are not responsible for any financial gains or losses made after reading this article. Cryptocurrency exchanges are frequently compromised, and the cryptocurrency market is particularly volatile. Readers are encouraged to exercise any and all security options present when trading cryptocurrencies, and consult with a certified professional for financial advice. Despite entering the market relatively late as an exchange, Binance already leads the way in several different areas, including asset variety, trade volume, and security. However, poor support and a lack of fiat options mar an otherwise exceptional experience.